Finishing any construction or remodelling with concrete stencil patterns can be a unique way to make an otherwise plain décor stand out from the crowd. Whether it is an entryway or a sidewalk, these patterned stamps and stencils are aesthetically appealing and create a design that will capture the eye and imagination of anyone who comes to visit. 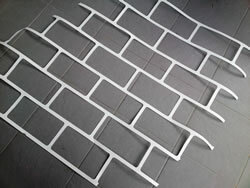 They can add to any business or home construction and can bring both inside floors and outside walkways into the flow of the entire interior and exterior design of the structure. With so many options available, these pre-molded stamp patterns can appeal to any décor. These designs can be either very simple, such as for sidewalks, or a very eccentric motif that accentuates places like entryways or patios. Due to the diversity of these molds, there are wide varieties of choices that can be decided upon the final product. In addition, this means that the right stencil can be found no matter how unique the desired design is. Our team of professional concrete contractors in Sydney are able to provide you with a full range of concrete stencil patterns for your home or business. Ideally you’ll get the greatest benefit by viewing the concrete stencils or stamped concrete patterns in person to get a good feel for the texture and patterns that can be chosen. Having said that, it can be very useful to browse ideas online through different sites that offer sales of concrete stencil patterns and then ask us if we are able to match those designs. If we don’t already have that concrete stencil pattern then it’s very likely we are able to get it in for you. Are you looking for one of a kind pattern? What we’ve found our clients have suggested is that our range of concrete stencil patterns and stamped concrete options is far beyond what other concrete resurfacing companies provide, allowing you a unique service not likely to be made available elsewhere. We have found in Sydney that having that ‘one of a kind’ design is really quite important. 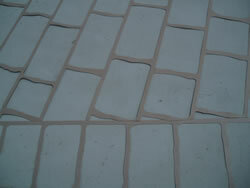 With variations in patters also come differences in the colour of the finished concrete. Each design’s uniqueness is topped off with its own one of a kind colour scheme. This is just one more way in which these pre-stamped concrete can produce a satisfying finished product that will prove to be worth the investment. Like many of our Sydney clients, you’ll be quite amazed at the impressive range of colours, styles and textures available that will cater to any taste. They are great ways to outline landscaping or areas used for entertaining guests as well as for foot paths, patios and driveways. No matter what the desired look, using stamped concrete or concrete stencils can give any indoor or outdoor area a very distinct and modern look. Concrete stencil patterns can help bring any entryway, walkway or driveway to life. They are a great way for the decorating enthusiast to showcase their taste and beautifying skills or any home improvement aficionado. Enhancing a walkway, entryway floor, driveway, patio or pool surround is simple for home or business owners who are looking to increase the equity of the property as well as enjoy the aesthetic appeal that it provides. With little effort, a good stencil can be found to complete any building project and maximise the street appeal of any home. 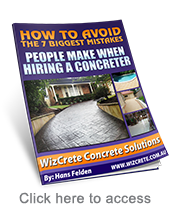 Wizcrete has won many awards and have a number of satisfied clients who have taken the steps to increase not only the look but the value of their Sydney homes by concrete stencils or unique stamped concrete designs. Give us a call today on the number below and we’ll provide a free quote backed up by our unique triple guarantee.